The carved rock city of Petra in Jordan is one of the most famous and beautiful landmarks of the Middle East (not to mention a filming location of the famous Indiana Jones and the Last Crusade). Every year hundreds of thousands of tourists are drawn to this UNESCO World Heritage site and one of the new Seven Wonders of the World. Vital to the tourist industry in the region are 1,350 donkeys and horses used to transport visitors on their back or in carriages. The burdens they have to carry or pull are often much too heavy in relation to the animals' diminutive size, and the working days are far too long. Many animals also have no shade from the sun, and insufficient regular fodder and water, quiet places, and veterinary care. They suffer from exhaustion, lameness, colic and incorrect medical diagnoses. This is why FOUR PAWS the international animal welfare organization– together with the Jordanian Princess Alia Foundation (PAF) and the Petra tourist board (Petra Development and Tourism Region Authority, – PDTRA) – has drawn up a project for the improvement of the health and working conditions of horses and donkeys in Petra. Both organizations and the tourist board will apply several measures to improve the working animals' situation, and will finance the entire project. "We're constructing stalls and water drainage systems, and we're modernizing an existing veterinary clinic", explains Robert Hengl, Head of horse project for FOUR PAWS. "We're also providing medicines, medical equipment, and training for the local vets, blacksmiths and animal owners." Together with two vets from the local horse clinic, a FOUR PAWS team is currently in Petra Park administering first aid to injured, sick horses and donkeys. Most of the patients suffer from painful injuries or infections on their legs, partly caused by galloping too quickly on ground that is hard and rocky. Six-year-old mare Alebayah is a typical example; for months she had a wound on her left hind knee that refuse to heal. FOUR PAWS vet and horse expert Ovidiu Rosu took a sample of fluid from the knee and sent it to a laboratory to analyze the type of bacteria causing the infection. "As soon as we've identified the bacteria, we'll know which antibiotic to give Alebayah", explains Rosu. "She mustn't work for a few weeks, and needs to rest a lot. I'm optimistic that with the right treatment, she'll be well again soon." Many of the owners are more than happy to take up the offer of free treatment for their animals, and are very pleased that FOUR PAWS is there. The new stalls will be ready in early summer; then all the working horses and donkeys will have enough fresh water to drink, they can be washed down, and can take a break in the shade. Over the next few years, staff from FOUR PAWS and the Princess Alia Foundation will provide regular veterinary treatment, and training for the owners. "We want to work together with the animals' keepers to let the horses and donkeys lead a healthier life", says Hengl. "Keepers who really know their animals and their animals' needs can look after them properly and act promptly in the case of, for example, health problems." By helping animals, FOUR PAWS also helps people since the horses and donkeys provide a livelihood for people in the region. 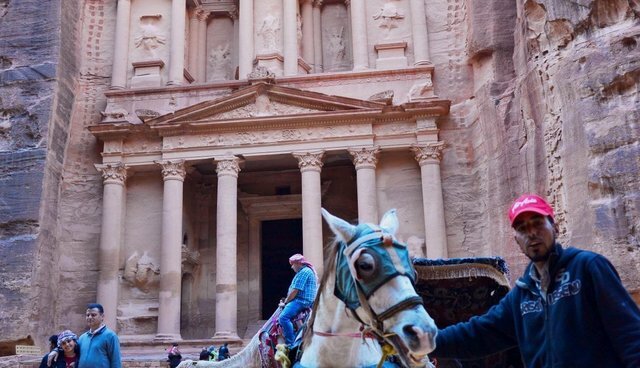 A single animal provides enough income to feed up to six people, meaning that around 8000 people around Petra are dependent on their horses and donkeys. For several years, FOUR PAWS has been successfully collaborating with the Princess Alia Foundation, which Princess Alia Al Hussein founded in 2009. The two organizations have worked together on several projects to help strays in Jordan, and are currently collaborating on the construction of a refuge center for wild animals in northern Jordan: "Al Ma'wa for Nature and Wildlife". The shelter will soon provide a beautiful home to big cats and other wild animals from poorly kept conditions or the illegal animal trade.